Referring to her Indian-American heritage and some of the bitter experiences she endured while growing in her home town in South Carolina, Nikki Haley said she has zero patience for bullying. Washington: US envoy Nikki Haley has accused the UN of "bullying" Israel, saying she will not tolerate a situation where the world body of 198 countries spend half their time attacking the Jewish nation. Referring to her Indian-American heritage and some of the bitter experiences she endured while growing in her home town in South Carolina, Ms Haley said she has zero patience for bullying. When I grew up, we were the only Indian family in a small southern town in South Carolina. On the whole it was a great friendly community. But that didn't mean every day was great. My parents were immigrants. My father wore a turban, my mother wore sari. There were times that we got bullied, the US ambassador to the UN said. 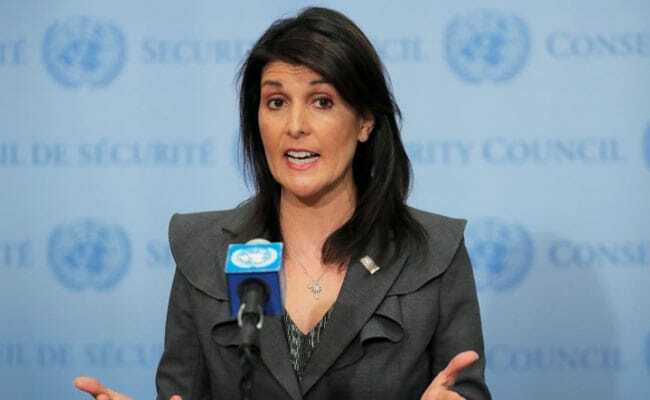 I stood up to bullying then, and I will stand up to bullying Israel at the UN, said 46-year-old Haley, the first Indian-American to serve on a Cabinet rank position in any presidential administration in the US. "We will not tolerate a situation that a world body of 198 countries can spend half their time attacking one country: Israel. What used to be a monthly Israel bashing session now at least has more balance. But we're never going to put up with bullying," she said amidst a standing ovation from the audience. She alleged that in the UN and throughout the UN agencies, Israel does get bullied. "It gets bullied because the countries that don't like Israel are used to being able to get away with it. That just doesn't sit well with me, Ms Haley said in her address to the powerful American Israel Public Affairs Committee (AIPAC). The UN spends more than half of its time singling out one country. We will not stand for it any longer," Ms Haley said as she reiterated the pledge of the Trump administration for its commitment to the Israeli. If we want to talk about security in the Middle East we should talk about Iran or Syria or Hezbollah, Hamas, ISIS, the famine in Yemen. There are probably 10 major problems facing the middle east and Israel doesn t have anything to do with any of them," she said. Defending the decision of President Donald Trump to recognise Jerusalem as the Israeli capital, she said America did not make Jerusalem as Israeli Capital, it was, is and always will be Israel's capital. "What President Trump did, to his great credit, was recognise a reality that American presidents had denied for too long, she said. Mr Trump recognised Jerusalem as Israel's capital in December and announced that the US embassy would move to the city in May, shortly after Israel's 70th anniversary. The decision caused uproar in the Arab world and led Palestinian leaders to reject a US role in mediating a resolution to the decades old Israeli-Palestinian conflict. Trump yesterday said he might even the visit Jerusalem in May this year to open the new American Embassy there.